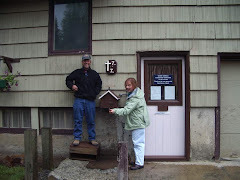 With help from Catholic Extension Holy Rosary Alaska Mission was able to repair its gray water system. When the weather goes down to 300 foot ceilings and 1 mile visibility, a missionary always has work to do. My project for the last few months is repairing the basement drain. I did not really know what I was getting into, but I am learning fast. August of 2010 we started digging by hand to try to find what was causing water to back-up in the basement. After digging for four days, we discovered an old wooden crib. Pat Durbin and Bernie Venua finally uncovered the pipe. Below, Pat Durbin searches for the crib. 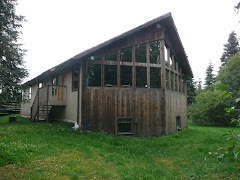 The Archdiocese of Anchorage, with help from Catholic Extension, has set aside a few thousand dollars for major repairs to the property. The total estimate of the work is 3,800 dollars. Some of the work was donated by local contractors and JD Bennis, Pat Durbin, Bernie Venua, and other parishioner of Holy Rosary Parish donated time and talent. 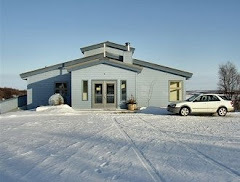 Before Jackson McCormick brought in the heavy equipment, here is what it looked like October 26, 2010. Before the equipment rolled in I gave Nushagak Cooperative a call and they came out to do a "locate" of the underground power and phone wires. Jackson McCormick, a local Dillinghammer who has been installing septic systems in this area for over 30 years, sizes up the job. Jackson donated a system in the 1980's for the Cathoic Church, which is located on the other end of our graveled parking lot. Jackson's wife helps get the back-hoe off the low-boy. 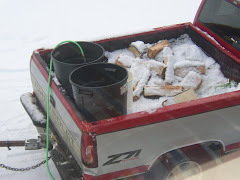 Alaskan Job Interview: Jerry, one of our neighbors, came by with his dog on a four-wheeler to ask for a job while the equipment was being un-loaded. This is finally going to happen tomorrow, October 27, 2010 at 11:00 AM. YEAH! Well, it did not start at exactly 11:00 AM, but by noon the crew was all present and started fueling the heavy equipment. After jumping down into the seven foot hole, Jerry uncovers the pipe leading out of the basement. Gravel is then dumped around the end of the drain pipe to fill in where the old wooden crib was dug out. JD Bennis helps out with his Bobcat. 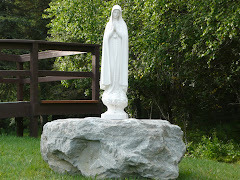 Holy Rosary is brought into the 21st century with this cutting edge septic system technology. Jackson McCormick, who has been installing systems for over 30 years said that this new gray water system technology was, "The Cat's meow. It out-performs everything else out there." That black piece is made out of plastic and fits over the end of the drain pipe. Other pieces (4 foot 6 inch sections) are attached to that. The new system is extended. Each hard plastic section is about four and one half feet long. It is set right on top of two or three feet of gravel. JD Bennis dumps in another load of gravel. JD, a parishioner of Holy Rosary Parish, is donating his time and talent. Those black plastic shells on the left are layed out end to end on top of the gravel and that is basically the system, so simple! Jerry and JD jump down into the hole and spread and level the gravel. Next, the entire system will be covered with another foot of gravel. Then, some kind of synthetic material is used to cover the last layer of gravel. The object is to not have any gravel showing so no dirt will touch the gravel when the system is filled in completely. By the way, those little white specks on the picture...snow. A blizzard graced us with its presence about halfway through the installation. Finally, the gray water system is filled in with dirt and packed down. After JD smoothed out the area with the Bobcat, here is a picture of the FINAL PRODUCT. 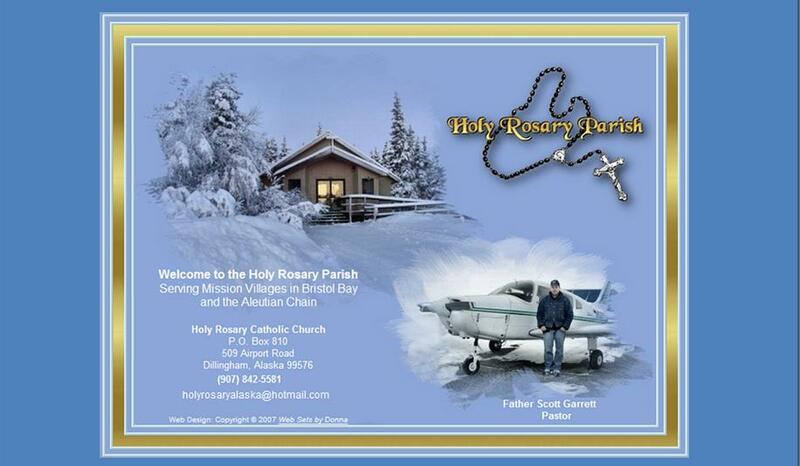 Thank you all for your help and support of Holy Rosary Alaska Mission! 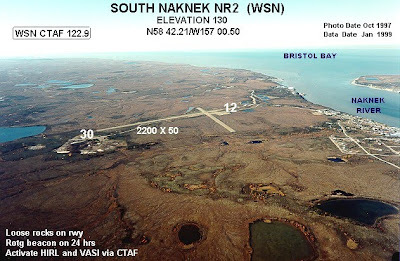 South Naknek is a gravel runway just across the river from Naknek. While relaxing at Saint Theresa two weeks ago I was monitoring the frequency 122.9 and heard the professional sounding young man practicing his landings in the pattern. His father Pat senior was instructing him. During practice the first week of October, before he soloed, Pat junior wanted to take a couple of young ladies from high school flying with him. His flight instructor dad reminded Pat that he does not have his license yet and “I am coming with you.” Pat senior said that his son was a little distracted after the flight with the girls because he left the cargo door unlatched and had to go back and lock it up. 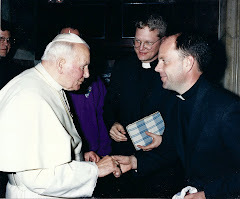 After Mass Sunday I asked the young aviator about his first solo flight on Thursday, October 14. He said, “I was REALLY excited.” He told me after that first landing he took-off again and did several more touch-and-goes. Not too many people get to solo an airplane before getting a drivers license. 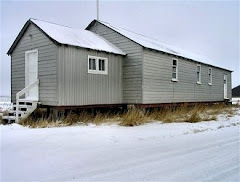 After Mass at Saint Theresa in Naknek on Sunday, October 17, 2010, while Mary, Pat’s mom, was counting the collection, Pat and his 14 year old sister Jennifer were waiting in the car. They actually raced to the car and by the looks of it, Jennifer won. Both wanted to get a little driving practice in because both have their driving permits. Pat and his sister Jennifer vying for that driver's seat. It is never to early to start preparing for the Christmas Homily. Last year I used a nativity puzzle. It worked so well I decided to do it again. The idea is to hand out each puzzle piece to families with children before the Mass begins. During the homily the children are called up one by one to to place there puzzle piece on the board. Each piece is a mini-homily, i.e. talk about the North Star, Mary, Joseph, etc. The final piece is the Baby Jesus and I will try to have the family with the youngest child bring that last piece forward. First I got on-line and ordered a nice large nativity poster. 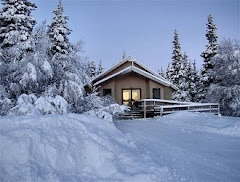 It took a couple of weeks to get here because I am in Dillingham, AK, in the middle of the Alaskan Bush. Next, I found an old piece of paneling and glued the poster to it. After the poster dried to the wood paneling I took a razor blade exacto knife, a steel straight edge, and then cut the puzzle into 11 pieces. The poster I purchased did not have a North Star so I had Katlyn, a seven year old parishioner at Holy Rosary Catholic Church, draw one, cut it out and color it. I then glued it to one of the pieces of puzzle. I used velcro squares to attach each piece. I put both sides of the velcro on the puzzle piece and then pressed the puzzle piece onto the board. After pressing down firmly all around the puzzle piece I pulled it off the boar. The fuzzy half stayed on the puzzle and the other side stuck to the board. The faimily with the youngest child gets the honor of placing the last piece in the puzzle. Glue the poster on the paneling. With an exacto knife, cut the nativity poster up into 12 pieces, more or less. Be sure at least one contains the entire infant Jesus. Number each piece of puzzle (in the order you want to put them up, I am doing the border first then saving the pieces like Mary, Joseph, and Jesus until last). Frame the plywood board that the puzzle pieces will be attached to. Put all the pieces on the larger plywood and again, trace very lightly each puzzle piece.. Put the number of each puzzle piece on the corresponding drawn out piece on the plywood. Should be done with a pencil so that just I can see the number and the outline, not the congregation. Use Velcro to put each puzzle piece on the board. I used a few squares for each puzzle piece, depending on the size of the piece. Hand out pieces of the numbered puzzles to children before mass or call them up during the homily and hand out the pieces. I am going to be creative here. Since it is my first time doing it I really don’t know what I am going to do yet. Talk about the toys children get for Christmas. For example, one of the all time favorite toys is a puzzle. What kind of puzzle is this? Most children will see the Velcro dots and say “connect the dots.” If you want introduce the volunteer Christmas angel or altar server who will be putting up the border of the puzzle. As you put up pieces of the puzzle, talk about them. If it is only a partial picture, ask the children to guess what it is. Star of David: Led the wise men to the manger. Illuminated the way for the shepherds. Pointed to the biggest event of the world. Inn Keeper: Although there was no room in the Inn in Jerusalem, the inn keeper had a manger. Joseph: A very dependable, honorable, responsible, skillful, and religious man. Mary: Mary was conceived without original sin so that she could give birth to a savior. She was a virgin who became pregnant with our savior. The angel Gabriel told asked her during the annunciation, if she wanted to bear the Christ child. She said yes. The savior would be fully human and fully divine. The last piece will be the infant Jesus. Put that in and then briefly review the entire story. Jesus: Baby Jesus. The reason we are here. Christmas is a time to celebrate the birth of Jesus. After Mass, process out with the picture held high. Remember, its never to early to start preparing for a Christmass Mass. From the last week in September to the first week in October, 2010, my flying activity went from out-and-out cancelations, to maybe, and to finally, the green light. 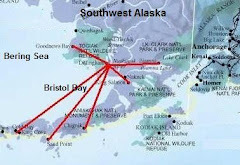 I reserve Saturdays for flying to King Salmon, I overnight there, and then fly back to Dillingham on Sundays. These past two Saturdays poor visibility, low ceilings, and atrocious winds motivated me to seek out the ever dependable Penair, who will fly IFR in their Caravan when the weather goes below VFR minimums. It was an easy decision for me not to fly. Over the past few months I have been stranded in King Salmon at least two Sundays out of every month waiting for the weather to clear so I could take-off. 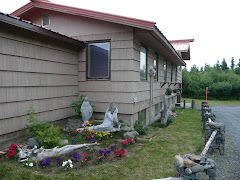 My Mass schedule is tight and I only have two hours and thirty minutes to fly from Mass at Saint Theresa in King Salmon to Mass in Dillingham at Holy Rosary. It is about 64 air miles between the two villages. 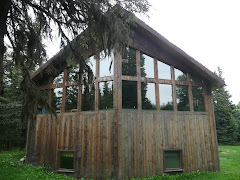 Several times these last few months I have had to cancel Mass at Holy Rosary in Dillingham. 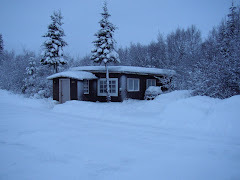 On Wednesday, September 29th, I was prepared to fly to Igiugig but ended up winterizing my airplane instead. Wednesday turned out to be a 35/35 day (the wind was blowing 35 MPH and the temperature was 35 degrees. When in the air, this cold weather oil plate covers the oil cooler and helps the engine oil warm up in sub-zero temperatures. Cold weather oil plate kit, engine heater, electrical harness, 100 foot electrical cord, cockpit heater, survival bag, wing covers, and engine blanked are just a few of the necessities when flying in sub-zero Alaskan weather. Here is a short video describing some preparations for winter flying. On Friday, October 1st, I had to cancel going to Clarks Point, which is only 12 miles from Dillingham. The Cherokee Warrior II was fueled, packed, and ready but the wind was gusting to 30 mph, the ceiling down to 1200, and the visibility to three miles. Flying in this weather was tempting but a definite “maybe” for me. These are the tough judgment calls for me to make. One has to take into account flying experience (my meager 600 hours), the terrain, a whole plethora of weather data, and then determine if it is safe to fly the 12 miles and back. I opted for not flying, which REALLY bothers me sometimes. I then called people in Clarks Point, canceled Mass, and told them I would see them next week! Monday, October 4th, I finally made it to Igiugig. I waited for fog to lift over the Nushagak River and was off the ground by 10:30 AM. It was a green light for me after I talked with the Dillingham Flight Service Station and got the weather trends. The weather was suppose to improve throughout the day!! Just before taking-off from Dillingham I took a picture of my Garmin 550. 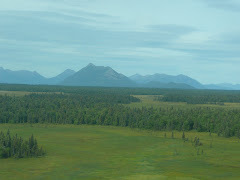 Here is a videos while in route to Igiugig, Wednesday, October 4th, 2010. Landing at the Igiugig dirt strip, Wednesday, October 4th, 2010, Runway 05.